Welcome to my review of the Vortex Optics Solo 10×25 Waterproof Monocular. This monocular is designed to be compact and lightweight, allowing you to add a monocular to your travel kit without bogging you down with something that is cumbersome and heavy to carry around. How well does it actually perform, though? Let’s read on and you can decide for yourself. When you get your Vortex Monocular, you’ll find included everything you might expect, plus a little extra. The accessories are well made, with the exception of the case. The case is good, but the sides of the case are constructed of a cheaper elastic than I would expect from Vortex Optics. Their accessories are typically well designed and constructed from excellent materials, but it seems they might have gotten too hasty with this case. This monocular offers magnification from 10X magnification, and features a small 25mm objective lens. The clarity and resolution are fantastic, and you can pick out very tiny details that some other models of monoculars don’t show clearly at all. What Type of Optics Does the Vortex Optics Solo 10×25 Monocular Have? The Vortex Optics Solo 10×25 Waterproof Monocular has fully multi-coated optics for maximum light transmission and multiple anti-reflective coatings on all air-to-glass surfaces. The monocular uses a roof prism optical system, allowing for excellent durability and a more compact size, and the lenses are sealed with O-rings to keep water, dust, and debris out. Vortex has nitrogen-purged the barrel of the optics for fantastic waterproof and fogproof performance, and the image quality is fantastic in all weather conditions. I’ve used this monocular in rain, sleet, and snow, and it has provided fantastic performance in all of those conditions. The field of view through this monocular is 31.5 feet at 100 yards (315 feet at 1,000 yards), providing you with a healthy field of view for such a compact optic. The adjustable eyecup twists up and down for a custom fit for viewing with or without eyeglasses, but I found it to be less than optimal for use with eyeglasses. I was able to make it work, but I had to press the monocular uncomfortably hard against my eyeglasses. The Vortex Optics Solo Monocular is built to last, featuring rubber armor to provide a secure, non-slip grip. The rubber armor is well made, and provides a very durable external protection for the delicate optics within. Let me point out again that this is a compact monocular. It is tiny! 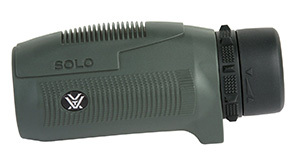 The Vortex Optics Solo 10×25 Waterproof Monocular weighs less than 6 ounces, and is only 4.4″ long by 2.2″ wide. The hand grip width is 1.8″, which is just about perfect for fitting in your hand. This is a monocular that you really can’t afford to leave behind, because it takes up almost no room in your pack and weighs less than an MRE. The rubber armor on the Vortex Optics Solo 10×25 Waterproof Monocular provides quite a bit of shock resistance to the monocular. I’ve dropped this off a cliff (by accident), and it suffered no more than a few scratches and scrapes to the body. The optics still work perfectly, and the monocular is still an essential piece of my kit. Vortex backs the Vortex Optics Solo 10×25 Waterproof Monocular with their VIP lifetime warranty, a transferrable warranty that follows the monocular from owner to owner. How Well Does the Vortex Optics Solo 10×25 Waterproof Monocular Work in the Field? For such a tiny monocular, the Solo Monocular works stunningly well. I’ve used this at the shooting range, out in the field deer hunting, and have even taken it along with me for backpacking trips. It adds so little weight and takes up almost no room at all in my pack or on my belt. I honestly can’t imagine going to the shooting range or to the field without this accessory. On one hunting trip, I thought I spotted movement in the bush, but couldn’t really get a good bead on anything through my crossbow scope. Out comes the Vortex Optics Solo 10×25 Monocular to take a better look, and sure enough, there was a buck bedded down in the grass about 100 yards from my position. After sighting the buck through the monocular, I was able to carefully move my position closer to the deer so I could get a clean picture of him with my crossbow scope. Without the Vortex Optics Solo 10, I doubt I would have ever spotted that buck and made the kill. Thanks for reading my review of the Vortex Optics Solo 10x25 Waterproof Monocular. This is a great little monocular, with fantastic image clarity and contrast. I've found it immensely useful at the range or in the bush, and wouldn't leave home without it. It's also inexpensive, so you aren't breaking the bank to get this fantastic optic.